The Frances Willard House Museum (FWHM) is temporarily exhibiting Hanna Dausch’s piece, I Hear You Sing To Me As You Sway. Below is the story and inspiration behind this work, as told by the artist herself. My name is Hanna Dausch and I am currently a senior at The School of the Art Institute of Chicago. I will be earning my Bachelor’s of Fine Arts degree with a focus in sculpture this upcoming May. Within the last year I have become extremely interested in woodworking and metalworking, both of which my art practice currently revolve around. I only started making furniture a few months ago and this rocking chair is the first piece I have ever made. I originally become interested in furniture making because my dad as always loved to refinish antique furniture and therefore we have beautiful wooden furniture around our house. With this interest in furniture I also began taking classes in historic preservation. Through taking these classes, I have begun to build relationships between sculpture and preservation of historic houses. 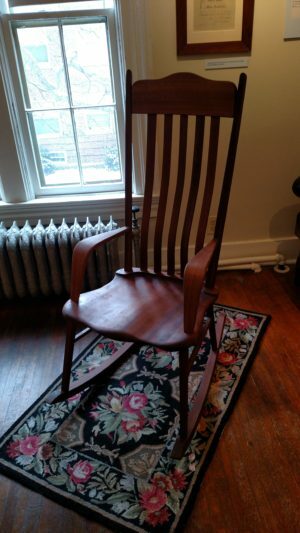 In one class I visited the Frances Willard House Museum (FWHM), where I got to take a close look at the design of the house and the furniture it contains. In awe of the highly crafted furniture, I grew intrigued with how it could fulfill a home and tell a story. Inspired by this, I started to make connections with the furniture in my house and how it tells a story of past generations of my family. I then saw this as an opportunity to combine my passion of sculpture with historic preservation and investigate my family history as a way of bringing it back to life. The idea for the rocking chair came from my grandma. I got my first job when I was fifteen years old. “Server at Hampton Fields Village Independent Living Retirement Community” was my title, which basically meant I served meals to the elderly at a nursing home. But, it wasn’t just any nursing home, it was the one my grandma lived in. Every night at 5:10 she would stroll into the dining room for 5:30 dinner and sit in the same chair at the same table with the same friends and look for me serving. When she saw me, she would get a big smile on her face and wave gently. Three nights a week I would serve her dinner while chitchatting with her, similar to when I was a kid and we would play “pretend restaurant” where I would take her order and serve her the best imaginary food in the world. About three years after I started, she passed away and I quit working there. It would never be the same again and I couldn’t bear to see someone else sitting in her chair. The rocking chair is one of the hardest pieces of furniture to make because you need just the right balance for it to rock properly. This is why it is perfect for my grandma. With inspiration from all of the rocking chairs in FWHM, I built my first piece of furniture that I hope to be the start of many more. I am beyond excited to share my rocking chair with the Museum and Archives, and thank everyone there for this amazing opportunity!